Sydney Australia meets New York, USA to create a masterpiece in Pop/Rock Ballads with soaring vocals, incredible guitars and a hook to die for. 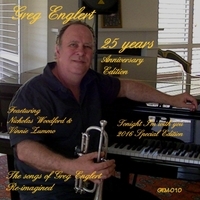 To celebrate 25 years as a music producer Sydney based composer, producer, musician Greg Englert decided to re-visit his previously released music. Rather than re-mix and use alternate takes Greg started a project to have his favourite singers and musicians from around the world re-imagine his compositions in their own special ways. The result is a series of epic special edition recordings ranging from Pop and Rock, through Jazz and Swing to Civil War Movie genres. ‘Tonight I’m with you’ was originally released in 2011 as part of a 4 song EP – ‘Tonight I’m with you – 4 songs of love’ (GEM-006), (Available at all good on-line stores) by Sydney based singer, composer, multi- instrumentalist Nicholas Woodford. The original version was a light pop/rock ballad reaching number 5 on several on-line music charts. Greg handed the re-imagining of this song to his great friend in New York, Vinnie Zummo (former Joe Jackson Band Guitarist, film composer and studio musician) to give his own special vibe to the song. Vinnie’s production and arrangement of soaring guitars, background vocals, drums etc results in a soaring, powerful song with lush layers of guitars and vocals that float up and support the original Nicholas Woodford vocals to perfection. Once heard, this song cannot be forgotten and you will find yourself singing the hook in your head constantly! PS please check out other songs from the 25th anniversary special edition releases for more amazing treatments of my songs! Where has it gone?, where did we go wrong?